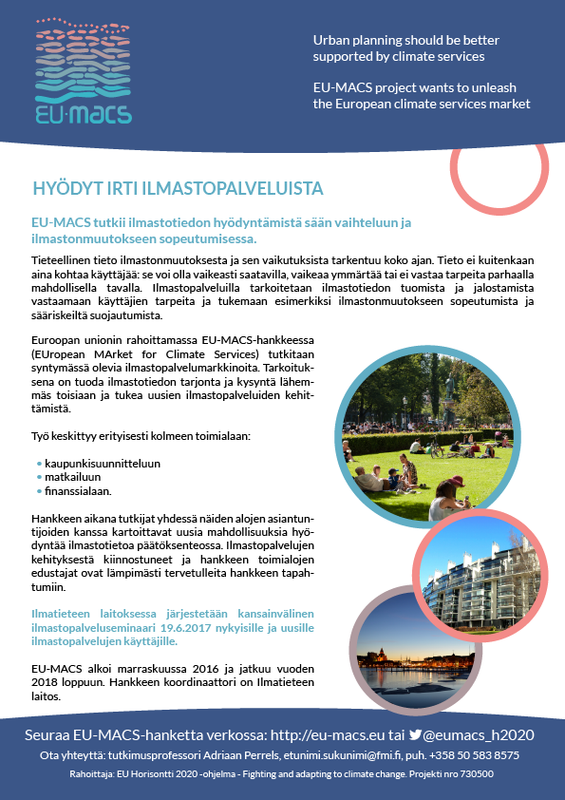 EU-MACS aims to make the wealth of climate information available for potential users in the form of climate services, turning information into usable and applicable resources for urban planners. Through Living Lab methodologies the array of stakeholders involved in the process are considered in the design of the service, focusing especially on the end-users. By closely involving quadruple helix stakeholders and developing the services from the end-user point of view, Living Labs aim to create holistic solutions through sustainable service development. In a nutshell, Living Labs are open innovation environments characterized by systemic co-creation, multi-stakeholder participation and active user involvement in real-life settings through multi-method approaches. Living Labs operate as intermediaries among citizens, research organizations, companies, cities and regions for joint value co-creation, rapid prototyping or validation to scale up innovation and businesses. 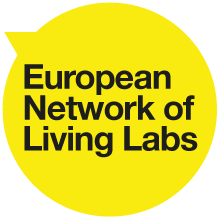 In the context of the EU-MACS project, Living Lab methodologies have been deployed for interactive market exploration and collaborative service development, including elements of real-life experimentation. The guidelines have been developed through an iterative process of reciprocal learning, where each of the methodologies listed in the guidelines have been utilized and tested in stakeholder workshops. The guidelines themselves have therefore been developed in a Living Lab way – from one activity to the next the learnings from the previous session have been taken into account and have lead to the creation of the next guideline, following the needs identified. Beyond the initially identified users and suppliers of climate services, there is a wide network of stakeholders to be considered in the design of climate services. Identifying and involving the quadruple helix stakeholders is important in reaching holistic solutions that serve all, rather than focusing on the few. Having identified the wider network of stakeholders it is also important to create a management plan for the interactions, ensuring successful and sustainable involvement of the different entities throughout the innovation process. The ultimate end-users in the innovation process, who we are creating the services for, are the citizens. Urban planners are planning cities of citizens, policies are created to attend to the interests of citizens, and new products and businesses are created to serve citizens. Therefore, it is important to consider the role of the citizen at the center of the innovation project. Furthermore, citizens may play a crucial role in the success of the end result, functioning in vital roles for maintenance or as information providers, possibly even either driving the innovation forward or blocking it. Engaging such a varied group of stakeholders, from different backgrounds and with varying levels of domain-specific knowledge is difficult to facilitate. In order to enhance cross-disciplinary collaboration & communication Living Lab methodologies help remove such language barriers, placing participants at equal levels and ensuring that all participants’ voices are heard. Such collaboration can be achieved through a multitude of methods where the designers of the system focus on the ideas or comments of the stakeholders/end-users as vital feedback in driving the development of the next step in the process. Prototyping and testing before going ahead with the process is central in Living Lab operations. Running pilot studies prior to implementation is an effective way to improve the initial design, change the direction of the process before it’s too late, or even abandon the project and start over instead of running the risk of implementing untested solutions. By doing so, the risks of failure are mitigated as the end-results are co-created by the adopters of the service themselves, ensuring that the climate service created is one that the users need, understand and want to use. Taking into account insights from various stakeholders and findings from pilot studies while learning along the way requires agile project management. The running of the project itself is organized in such a way that the various feedbacks can incrementally as well as radically change the direction of the service development. Framework for Agile Living Labs is a Living Lab methodology for the agile management of the project overall, allowing the stakeholder’s voices not only to be heard but to be taken up in the design of the service being created. Quadruple helix stakeholder engagement is a central factor in Living Labs. It brings together stakeholders from public institutions (at the level of cities, regions & local, regional, national & European policy), private organizations (start-ups, SMEs, corporations), as well as academia (researchers, universities, research organizations) and citizens. This leads to the inclusion of representatives from each sector in innovation processes, creating results from which all involved stakeholders can benefit. Facilitating exchanges and collaborations between such a diverse group of stakeholders, with different backgrounds and knowledge areas, is important for creating holistic solutions that serve all of them, rather than focusing on the few. In Living Labs, stakeholders are sometimes arranged in panels. A well-planned panel management process allows the Living Lab to create meaningful activities and sustainable processes for the involvement of the different stakeholders. In these panels, the final recipients or beneficiaries who will use the solutions created are referred to as users, and the methodology ensures that their role is carefully planned and executed to consider also the wider network and interactions with other stakeholders who need to be involved, how, when, where and their role in the panel. For example, in a health-related Living Lab project focusing on seniors, their caregivers, families and general practitioners should be included as well. Climate change implies complex and dynamic challenges for cities and its inhabitants. The involvement of different stakeholders, such as citizens, becomes essential when dealing with environmental challenges as it can have an important effect on reducing conflict, building trust and facilitating learning. Engaging citizens can ensure that public values are taken into account in the framing of future solutions or policies, developing further understanding of complex trade-offs and choices that need to be made. In Living Labs citizens are placed at the center of innovation – empowering the citizen’s voice. Urban Living Labs are environments for the co-design processes towards the development of innovative city services. They place the citizens at the center of innovation, creating an ideal scenario to generate solutions that mould according to the specific needs and aspirations of local contexts, cultures, and creativity potentials. Citizens then become a valuable source of first-hand knowledge about a city’s needs, problems and opportunity areas. Solutions co-created with citizens can generally result into more diverse ideas as well as cost-efficient and well received solutions. The approach used to include considerations towards the role of the citizens in the process was a co-creation workshop focusing mainly in reducing the gap between information providers and the information needed at an urban level. At this very initial stage the Living Lab methodology was used to consider market exploration and collaborative service development, while investigating the integration of citizens as end-users and information providers. The workshop was designed in order to obtain input for a stakeholder map and initial ideas for climate services needed at urban level, from the citizen point of view. There are many different methodologies and tools for involving citizens in Living Labs. In the context of the EU-MACS project, two methodologies were chosen for exploring the role of the citizens in the process: personas (including the pains & gains template) and customer journeys. Communication is important in any kind of collaboration – and when bringing together stakeholders from different fields with varying levels of knowledge across domains, communication becomes especially important. While experts in the field frequently use specific terminology relating to their field, other stakeholders and end-users are often not familiar with the terminology. In some cases specialized terminology may seem as a completely different language. Through co-creative processes, Living Labs operate as intermediaries between the different stakeholders, facilitating the interactions and driving the innovation forward. Living Labs are based on a multi-method approach where the most suitable method for collaboration is selected to fit the purpose. In this case, the need for a collaborative tool was identified, facilitating discussions among the different stakeholders. Lego Serious Play is one of such methods, in this case selected for the purpose of allowing participants to communicate, collaborate and co-create around one table while speaking the same language. The method encourages creative thinking, improves common understanding and ensures that each participant around the table has a turn to speak and share. Through the use of models built from Lego bricks the participants are directed towards a simplified language enhanced by hands-on learning and reflection. During the Lego Serious Play workshops participants from private, public and academic institutions were brought together in a structured problem-solving activity involving Lego bricks. The challenges were formed to investigate the different points-of-view, current information needs and ideas for climate services for each of the quadruple helix stakeholders: public, private, academia and citizens. Prototyping and testing is crucial in reaching a successful and long-lasting end-solution for user adoption. Prototyping in the early stages of the process allows the researchers to further understand user needs, to test the direction in which the project is moving and to validate findings from previous activities. Prototypes are also crucial in testing assumptions: while forming opinions based on your experiences is easy, spotting and understanding whether those assumptions are valid is not. Prototypes are able to point out such assumptions. Living Labs prototype and test in the form of pilots and field tests. First, small-scale pilot studies are performed in order to validate and improve the test in itself, ensuring that the larger scale trial – the field test – is tried and tested to run smoothly. Pilot testers therefore comment not only on the aspects of the project, product or service itself, they also comment on the way the test is run and how to improve certain aspects such as instructions, for example. After the test has been perfected through the pilots a large-scale field test can be deployed, including a wider set of testers focusing specifically on the subject at hand. True to the nature of Living Labs, the process behind the suggested climate service was prototyped and tested in a stakeholder workshop. A pilot test was conducted based on the process that was created behind the climate service. In order to create a collaborative tool, allowing the creation of a knowledge base and shared tasks, the users of this service are partaking in a process. This process was simulated and run in the form of a workshop, allowing the participants to experience the different phases involved and to comment on their importance, suggest improvements and discard aspects deemed unnecessary. In the context of the EU-MACS project, this workshop was the last activity in the series of Living Lab methodologies. This presented the basis for the process going forward: simulating the agile project development based on trials and testing, allowing participants to experience the process of creating prototypes and improving the process based on feedback. The session also included an introduction to the FALL methodology (guideline #5) providing a framework for the development of the climate service going forward. The Living Lab concept proposes a number of guidelines (user-centric design, iterative in-the-wild testing, user involvement & panel management, etc…), yet does not offer much in term of practical guidance on how to run an innovation project in real-life. Agile project management methodologies do offer such guidance yet have been critiqued for not providing a focus on the end-user. The Framework for Agile Living Labs (FALL) projects aim to provide practitioners with actionable guidelines on how to run a Living Lab project in an agile way. Agility means being able to fexibly integrate new information in the project’s roadmap, which is exactly the type of situation that a Living Lab project will find itself in, due to its focus on iterative testing with end-users. A first version of FALL has been described in http://www.timreview.ca/article/1048. Since then, imec’s Application prototyping and Living Lab (APLL) department have refined its application in numerous projects. This has been revised into FALL v2, based on our most recent experiences. The method is particularly focused on practitioners and its aim is to provide actionable insights on how to perform Living Lab projects in an agile way. Various agile project management methods exist. FALL is based on SCRUM, which takes an approach that is composed of steps that are limited in time (i.e. 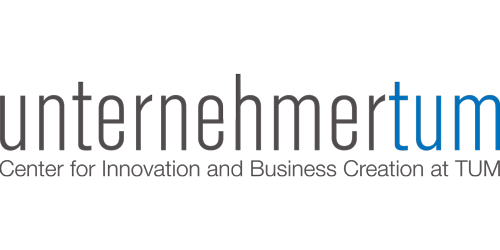 timeboxed) and focusses on incremental delivery. SCRUM structures communications in a project, making sure that expectations are managed correctly and that the team discusses critical issues. You can read more on SCRUM on https://en.wikipedia.org/wiki/Scrum_(software_development). 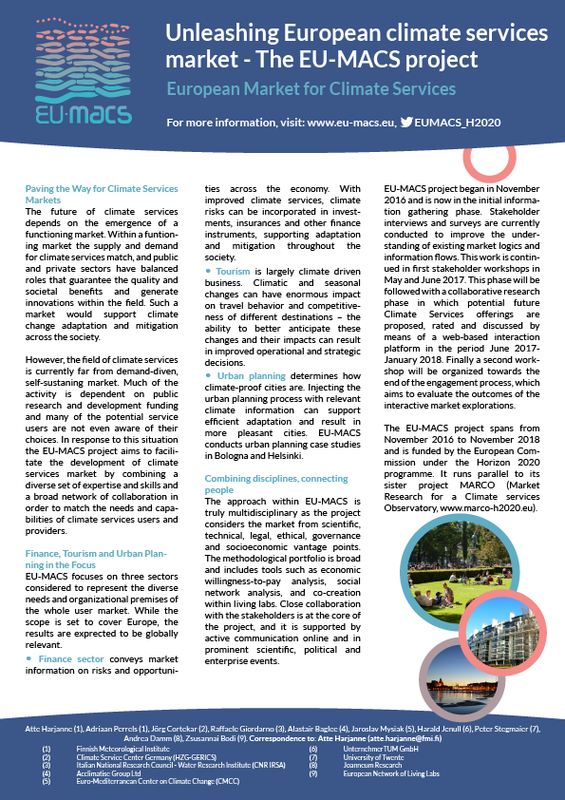 Keep informed on the latest news, events, and research results on how you can make use of better functioning climate services market.